Three patchwork backgrounds for shoe toppers, size 9.5 x 9.5cm 300 dpi jpg format. 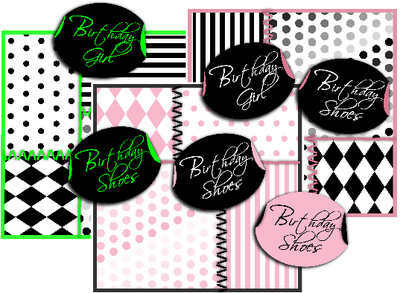 Black & Green, Black & Pink and Pale Pink & Black, with 6 coordinating labels in png format which have Birthday Girl and Birthday Shoes text - cut out and attach with foam pads. Mix and match with your embellishments and tags to make some great girly card toppers. Also great with boots and bags. The examples below have been layered on various cards.